This unprecedented compilation is the largest collection of psalms for worship ever published. Includes all 150 psalms, most in multiple formats. Bulk discounts are available and pricing will be updated in the cart for quantities of 10-49 and 50+ copies. Imprinting on the back cover is available at $2.00 US per copy (1-10 copies) and $1.50 US per copy (11+ copies). Please call 1-800-333-8300 or e-mail us to request imprinting. This comprehensive, single-volume anthology is the largest collection of the psalms for use in Christian worship ever published. Psalms for All Seasons contains all 150 psalms, most in multiple formats. Each psalmappears in its actual biblical text, including as responsive readings. Includesresponsorial settings for all psalms in the Revised Common Lectionary. Offers ideas for uses in worshipsettings. Uses a wide variety ofmusical and spoken settings, including metrical hymn, contemporary, global, chant, and responsorial settings, plus psalms interspersed with hymn verses, optional refrains, and new compositions. Psalms are set in formats consistent with their content. Provides complete musical settings for morning and evening prayer as well as basic musical settings for chanting. A full index allows searches by psalm, genre, occasion for use, subject, composer, and author. 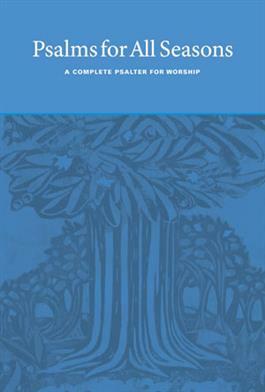 Anindispensible resource for worship leaders and churches of all traditions. Copublished by Faith Alive, the Calvin Institute of Christian Worship, andBaker Books. Learn more at PsalmsforAllSeasons.org. "Five stars is not enough to rate this excellent resource, edited by some of the brightest musical and liturgical minds in today's church. The most comprehensive psalter ever published, Psalms for All Seasons includes musical settings of all 150 psalms, most with multiple offerings in a wide range of musical styles. Worship planners will discover both responsorial and metrical settings, from chant to a hip-hop-inspired work; composers come from around the globe and from every era of Christian music. Some psalms have ten or more settings to choose from. The psalms are also arranged for corporate reading. Performance notes and psalm prayers are included as well."